Dr. Truphena Choti holds a PhD in International Education Policy from the University of Maryland, College Park. She is a senior international development expert and currently serves as the Director of Education with Nascent Solutions (NSI). In this capacity, she oversees United States International Development (USAID) and the US Department of Agriculture (USDA)’s education development projects in Africa and also supports ministries of education in strategic planning. Dr. Choti has a classroom teaching experience in all levels of education from Kindergarten to graduate school, more so in high school where she spent 10 years. She joined active pathfinder ministry in her native country of Kenya and later raising her own children as pathfinders. She is the founding Director of Living Springs Lions Pathfinder Club. 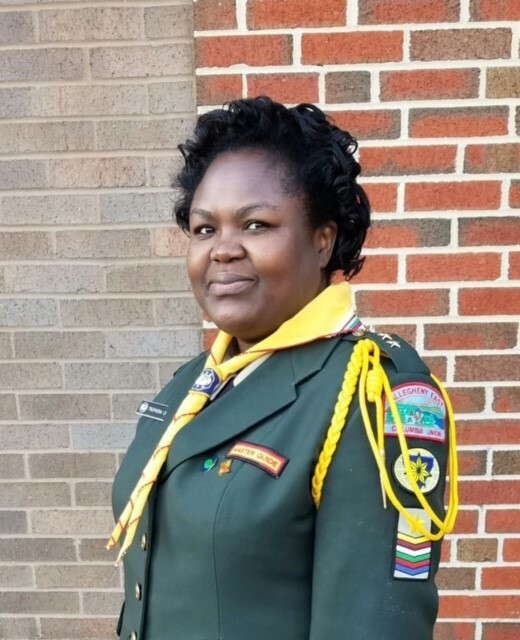 She has served as a counselor, Deputy Director and Director in various Pathfinder Clubs. Dr. Choti is a servant of the Lord and a community leader. She is currently an elder in Living Springs SDA Church (Maryland) and elder-in-charge of Women, Pathfinders, Youth and Education ministries. She is married to Dr. Charles Choti and together they have 2 young adult sons (Jeff &Martin) and a daughter (Naomi). Dr. Choti is widely traveled and mingles well with all cultures. She speaks fluent Ekegusii, Kiswahili and English. She believes that a strong character is built in the furnace of struggles and challenges and we can achieve all through Christ who strengthens us, Phil 4:13. Crystal Thompkins, holds a BS in Elementary Education (Oakwood College) and a MS in Elementary Counseling (Wilmington University). She is currently a fourth grade teacher at Towne Point Elementary where she also performs Assistant Principal Duties. She has three children; Caleisha, Aaron Jr., and Andrew. Her education shows why she is so passionate to work with both children and youth. As a member of the Bethuel Seventh-day Adventist church, she is an active member of AYS, Children’s Ministry, Usher Board and the Pathfinders. In these ministries, she has been AYS Leader and assistant, Pathfinder Directory and Deputy Director, Pathfinder Instructor, Sabbath School Superintendent and Assistant, Sabbath School Teacher, and Children’s Corner Storyteller. She has been apart of the AEPCA as the Assistant Area Coordinator for the Bay area (2005-2008) and the Assistant Treasurer 2008-2011 She currently is the Area Coordinator for the Bay area. The Allegheny East Conference Pathfinder Ministries is an outlet for the spirit of adventure and exploration that is found in every youth. One of it’s goals is the establishment of discipline with in it’s youth as they learn about Christ through nature, crafts, honors, and events. Anthony Francis, is a man of God who has a passion for working with young people. He takes his calling for leading youth very seriously and yet he always seems to be having fun. Bro. Francis is, in fact, a kid at heart and can usually be seen trying to squeeze joy out of situations that others might think absolutely tiresome. He served as Pathfinder Director for the Northern Stars Pathfinder Club in Paterson NJ for 16 years, he first served as the assistant Area Coordinator and now Area Coordinator for the Northern New Jersey area of the Allegheny East Conference Pathfinder Association. Anthony loves the Lord and makes a conscious effort to ensure that people around him are able to experience Jesus through their contact with him. He is patient, kind, temperate and generous with his time and his talents. The Bible texts that inspire him the most are Ps. 92 vs 1 and 2 “ it is a good thing to give thanks unto the Lord and to sing praises unto His name . . . to show forth His loving kindness in the morning and His faithfulness every night.” Bro. Francis has been a Pathfinder for longer than he can probably remember and remains to this day a servant of God and a friend to man.